The bright color and distinct flavor of cranberries makes them ideal for both culinary purposes and decorative uses. Fresh cranberries have a firm texture that makes them easy to work with. You'll find fresh cranberries in the produce section of most grocery stores. If they are only available in your area during the holidays, you can stock up on cranberries and store them in the freezer for use throughout the year. Fresh cranberries lend a distinct flavor to many dishes. They are commonly turned into a cranberry sauce around the holidays, but cranberries also work well in other recipes. Fresh cranberries are often used in muffins and quick breads to add both color and flavor. Fresh cranberries are also used for relishes, cookies, salads and drinks. The color of cranberries makes them a good garnish option, particularly for holiday meals. Place a few cranberries along the edge of the salad plate before serving your guests. Add fresh cranberries around hors d'oeuvres on the serving tray to fill in the empty spaces and add color to the display. Freeze fresh cranberries for pretty cold drink garnishes, or make large ice rings with cranberries frozen into them. Use the frozen cranberry ice rings to keep dips and other dishes cold. In addition to plate garnishes, cranberries also add color and interest to table displays. 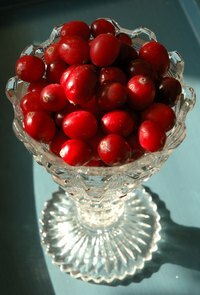 Fill a clear glass or small vase with cranberries. Attach place cards and place one next to each table setting. Fill ceramic bowls or trays with cranberries. Tuck in a few pieces of pine bough and some pine cones and use as a centerpiece. Another simple centerpiece idea is to fill a large vase with cranberries. Add water and place a flower arrangement in the vase. The cranberries hide the flower stems to create a pretty flower arrangement. Beyond the table, cranberries work for other home decorations. String the cranberries and add them to a Christmas tree or to a mantel display. Fill a large glass container with cranberries and nestle a candle in the cranberries for a decorative candle arrangement. Hot glue the cranberries to a styrofoam wreath shape. Tie a large ribbon to the top of the wreath to hang it. Another option is to poke a wire into each cranberry and attach it to a pine wreath. Make a hanging topiary ball by covering a styrofoam ball with leaves and cranberries. Poke a wire into the cranberries to attach them to the ball. Can I Use Queso Fresco in Lasagna?